From lock outs and replacement uPVC door locks to access control and garage door security, our fully qualified locksmith in Horsham possesses the knowledge and expertise to ensure we can fulfil the needs of both local domestic and commercial customers. 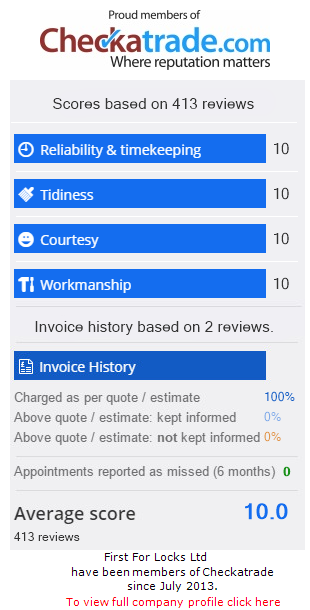 We are long standing and proud members of CheckaTrade. We can be with you within the hour, helping you get back on with your day. We provide on site emergency opening services night or day. We ensure that we carry out all work, causing as little damage as possible to your property. First for Locks understand that whatever your situation, getting a qualified locksmith in Horsham out to you as fast as possible is a priority! If you are locked out of your house or work premises, have had a break-in or have any other security problem, no matter what time of day or night you can call us on 01403 330483 and we promise a member of our team will be with you as soon as possible. Does your shop need extra security to deter vandals or burglars? Would you like to be able to guard your premises 24 hours a day? When we come to you for an emergency call out in Horsham, remember that there are NO CALL OUT CHARGES.